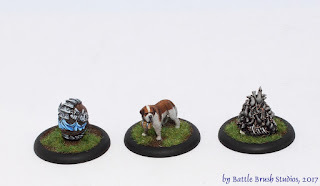 Another bunch of Guild Ball figures I painted last year and which for some reason I hadn't posted on here yet! It's a few mascots for the Masons Guild, Brewers Guild and Morticians Guild! 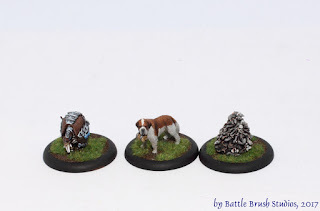 An Armoured Armadillo, probably the prettiest St.Bernard's I've seen in miniature (really, really good model. Not cheap, but great.) and a cheery pack of rats climbing atop some skulls. Fun for all the family.